We heard through the grapevine of one small business owner’s sticker plight. Verdun’s Eugene Shewchuk has owned his martial arts dojo, Club Kozak, on Wellington St. in the commercial borough of Verdun for 15 years and just this week has been asked to take his custom wall decals for business down abruptly. In lieu of this troubling news, here’s our little survival guide to keep the government from muzzling your creativity and your stickers! It’s a little pocketbook to help you keep in mind the right ways to Make it Stick! If you’re interested in finding out the rules and regulations for signage in your city, you can often find this information on your city’s website. For example, with a little digging, we found Toronto’s “Sign Permits & Inspections” page in their Services page. A whole document on Toronto’s Municipal Code regarding signs, permit regulations, and sign requirements could be taken right from this page and we can wax poetic about it for hours on end--but forget all that! 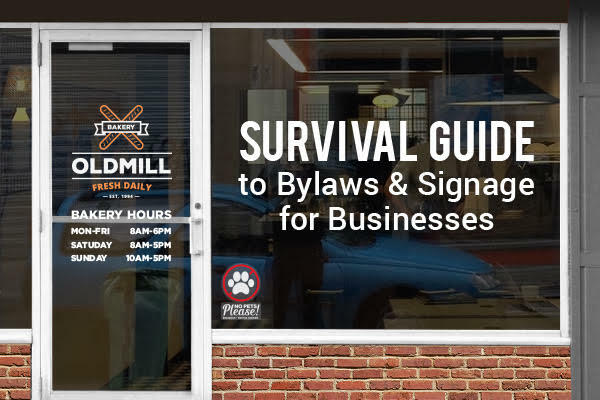 Your window signs will most likely be exempt from permit requirements if they are not electronic displays and the sign does not cover a certain percentage of the window area. In Toronto, that percentage is 25%: so long as the size of your signage does not exceed 25% of your total window space, it should be good to go. But, a mere outline stating the number “25%” is a little ambiguous, isn’t it? Verdun’s councilor thought so to: “You can see right through the window and you can see into the business, so again, 30 per cent. I’m still trying to figure out how we calculate it.” he said. Working closely with your signage/sticker supplier will help you adhere to your cities’ regulation. At StickerYou, our facility operates numerous industrial grade printing presses and we have production teams and design teams in place to ensure your stickers are the exact measurements abiding regulations. Using the size of your window, we can find a perfect size for your new signage! If you need help figuring out the best solution for your business windows, feel free to contact one of our sales specialists via our custom quote form. You can also test out our printing quality and materials for yourself! Request a free sample pack to try before you buy! For even more business branding, and life hack ideas, check us out on Facebook, Twitter, Instagram, Pinterest, Google+, and YouTube.